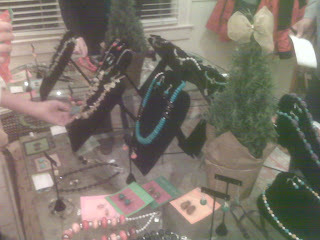 Buckhead Betty ... on a Budget: Last minute gift ideas: Jewelry by Beaded and Stoned! 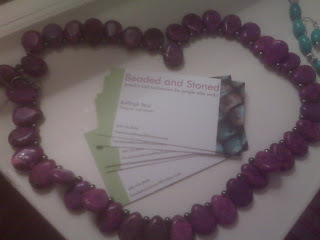 Last minute gift ideas: Jewelry by Beaded and Stoned! 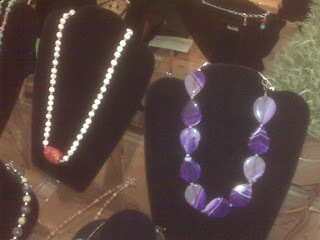 Last night I had the opportunity to swing by a Jewelry Trunk Show featuring the FAB jewelry made by our friend Kelleigh. Her friends loved these pieces so much that she started a little business on the side called Beaded and Stoned. The necklaces and earrings are just precious, and they are fantastically priced when you think about what you might pay in the store - for example, huge necklaces like the ones below are about $60 instead of $100! Sorry about the poor quality, my camera is (still) dead and all I had was my poor Blackberry, who's camera is slowly losing quality after all the impacts with the ground these few years (woops!). 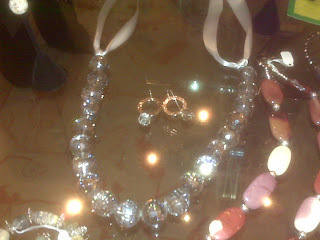 I wish I had better shots - but even with these, you can tell that the pieces are absolutely fabulous. Kelleigh is set to launch a website featuring her products in the next month or so, and I will definitely pass word on to you all when it goes live. In the meantime, if you think you might want to check out her inventory, or see something here that you like, leave a comment and I can pass you along to her! Thanks for the fun evening, ladies!! I can't wait to buy some of these items soon! Jen - you'd love it! I can't wait for her website to launch so I can share it with all of you.